The Germany national team are one of the most powerful and consistent sides in international football, with an excellent record in both the World Cup and European Championship Finals. Many of the games greatest ever players have worn the German football shirt over the years including Franz Beckenbauer, Jurgen Klinsmann, Michael Ballack and Bastian Schweinsteiger. 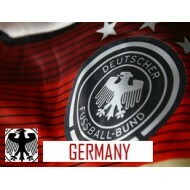 Get your Germany kit from our store in adult and kids sizes. You can also get your favourite iconic player printed on the back of your shirt with our specialised print service!